Because I was still new to quilting (and slightly impatient), I chose traditional blocks with fewer pieces, but I wanted a little challenge, too. So, I decided my twelve-inch blocks would have between nine and 16 pieces. 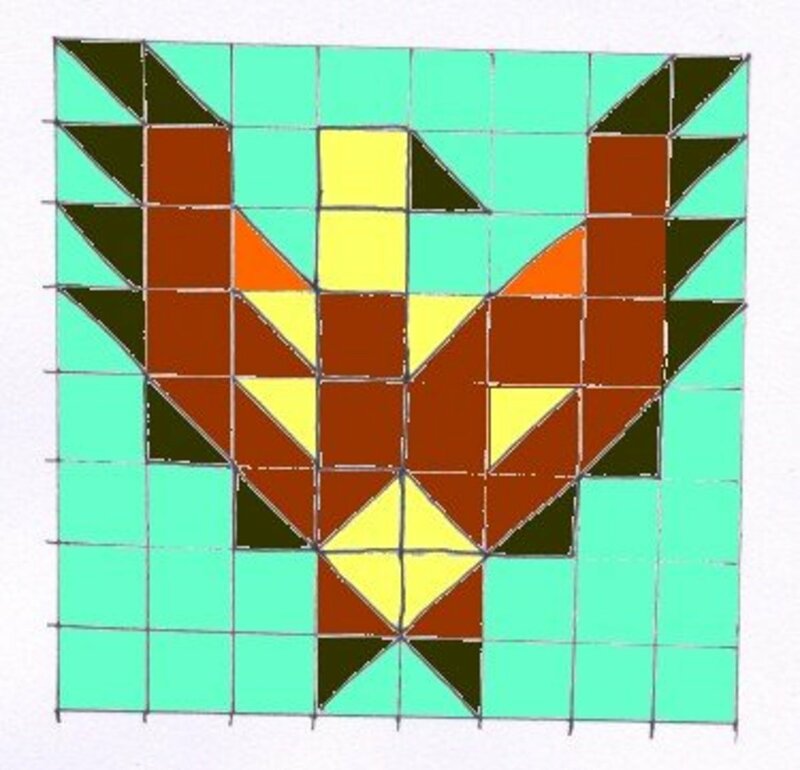 Georgia Bonsteel, in her first lap quilting book, provided a resource of practical, traditional blocks. From this, I chose not only the squares mentioned in the captions below, but Rail Fence, Ruth's Block, King's X, and Road to Oklahoma. I didn't use her construction method, but I loved her tips. My mother loved pastels, so when I went downtown to the Mill End store (now closed), I chose seven fabrics that I thought would please her: light yellow solid, light peach solid, pink plaid, tiny pale orange floral print, tiny green floral print, mint green solid, and an eggshell solid to join the blocks. I didn't know much about quilt-making then, so many of the fabrics were a cotton-polyester blend (100% cotton holds creases better when pressed with an iron). The two close-up photos below show some of the fabrics I used. 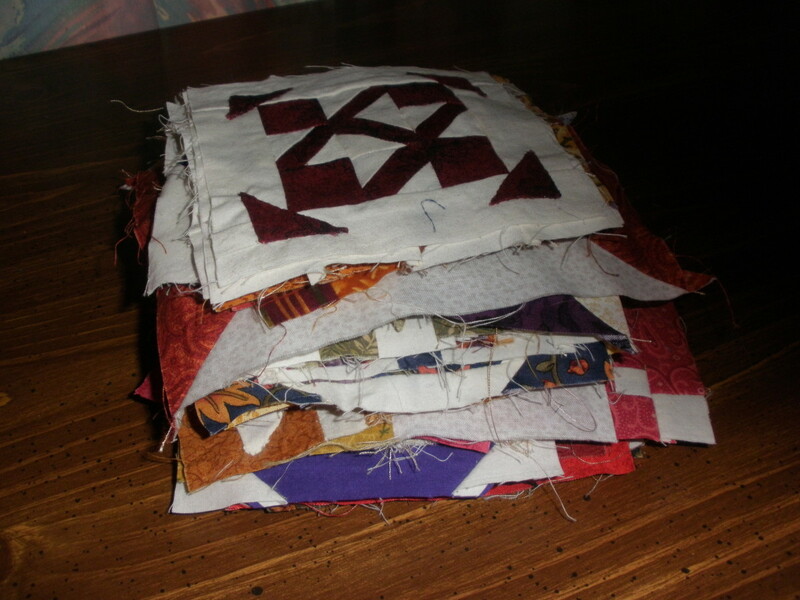 A side view of the sampler quilt. Closest three blocks: Double Four Patch, Oh Susannah, and Pinwheel. A close-up of one of my Oh Susannah blocks. Here is a King's X block. After all these years, i confess I no longer remember how much fabric I purchased or how much I spent. In those days, though, you could generally get a pretty good fabric for around $4 per yard. The following chart gives you an idea how much total fabric is needed for the quilt top, backing, and binding (modern method) for crib, twin, full, queen, and king mattress sizes. Typically, a crib (lap) quilt is 45" x 60", twin 70" x 90", full 81" x 96", queen 90" x 108", and king 120" x 120". Fabric requirements will vary depending on intricacy of piecing (more pieces require more fabric). Fabric is based on a 44-45" width. I used the handy chart from Georgia Bonsteel's More Lap Quilting for the above table in determining the yardage requirement for the binding of each size. The binding is cut on the bias and has a two-inch width. Today, designer fabrics by reputable companies are high quality. Once you get the feel of 100% cotton with a high thread count, don't hesitate to check thrift stores and yard sales for quilting fabric. You never know what you will find. Being a member of a quilter's guild or informal quilting group is helpful, too, as someone is always willing to swap a fabric or give it away after losing interest in it. You do want to choose fabrics with a relatively high thread count to avoid bearding, a term in quilting that means batting fibers are beginning to stick through the top of the quilt. Bonded batting is less apt to beard. When a neighbor's grandmother passed away, she left some fabrics that no one in the family wanted. My friend since childhood knew that I quilted and offered me the box of fabrics to see if there was anything I could use. These fabrics were undoubtedly from around 1940. 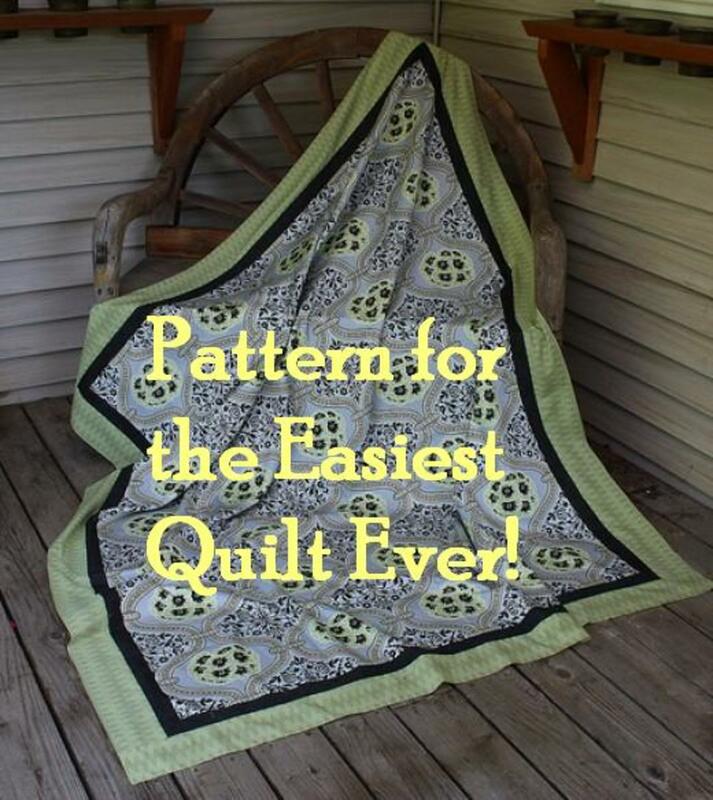 I picked out the two blue-green prints to create this quilt. The remaining fabrics were purchased from a fabric store. The nine-patch, custom quilt I made for my brother in 2007. A side view of my brother's quilt. A forties' fabric set in a near-solid, golden brown featuring my hand quilting. 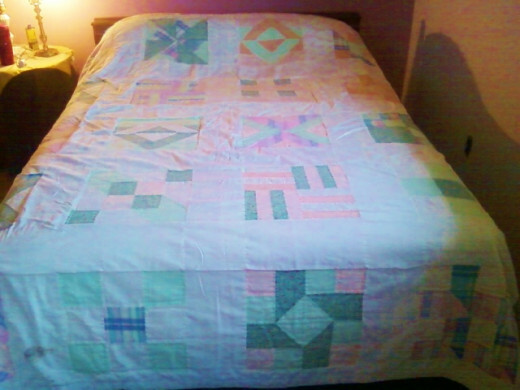 A nine-patch color variation that covers the pillows.The print is also a forties' fabric. I could have done more with the outer border, color- and design-wise, but I wanted to feature a pot-bellied stove because my youngest brother had always been interested in furnaces, heating systems, and fire. 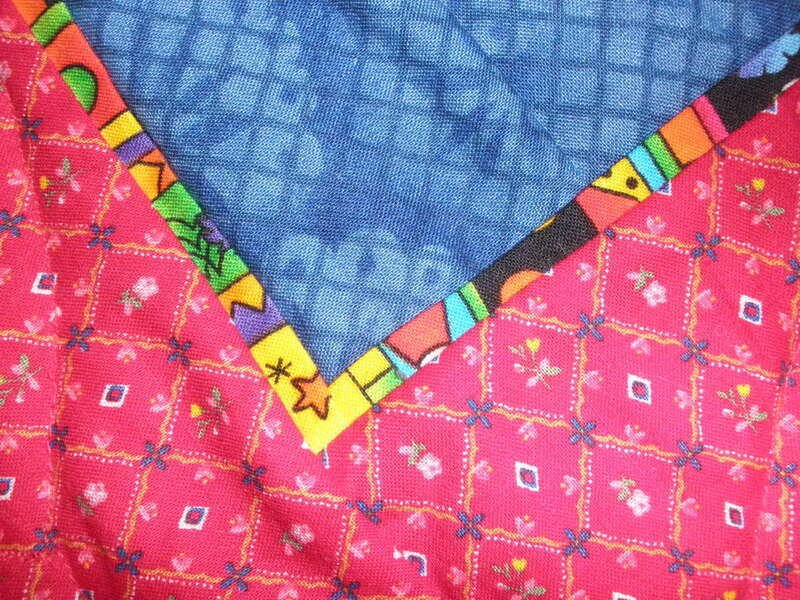 This is a close-up of my original stove motif of five that I hand quilted into the border. My original, pot-bellied stove design and hand quilting. White quilting thread on solid, eggshell fabric. I don't remember the exact time I spent making the sampler quilt for my mother, but I finished it in one summer (or so I thought)--about three months. Many years later, around 1984, my interest in hand quilting began to become serious, and I decided that I would hand quilt 1/4" from the pieced edges of every block. I used an 18" circular wooden hoop to do this. Although my stitches were fairly even, I was only putting about seven stitches per inch. 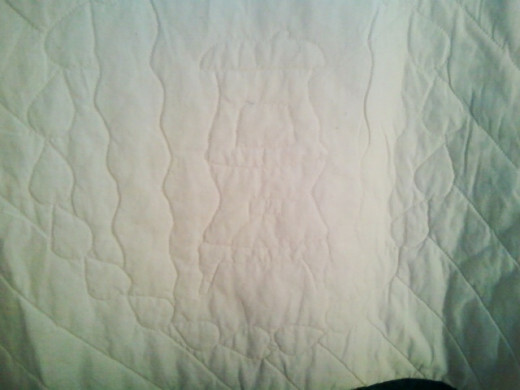 Because I had finished the quilt before actually quilting it, a significant number of ripples resulted. As the years further progressed, the binding began to fray also, which attests to the fact that I had not used the best available fabric for the quilt. To solve the problem, I added a pretty mint-green manufacturer's wide seam binding. My mother loved the quilt just the same until her death in 2009. 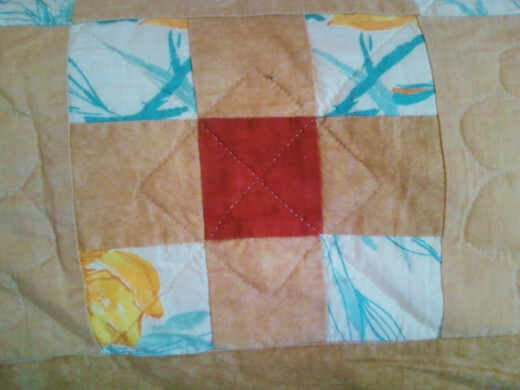 While my brother's nine-patch is a much simpler design, the quilt was more challenging because of its size. The mattress is only a full one, but a four-inch padding tops it, and the bed has an old metal frame that has an unusually high drop (not shown in the pictures). So, I had to do a fair amount of math to complete the design. 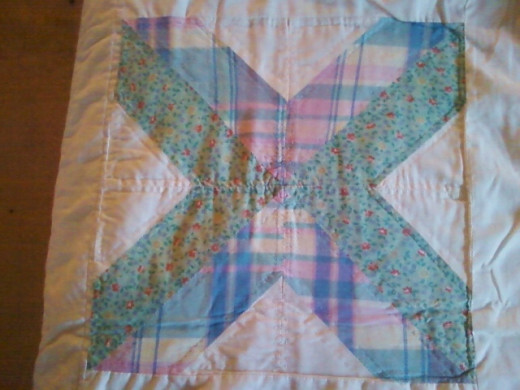 What I especially like about this quilt are the old fabrics mixed with new and my original pot-bellied stove quilting. The quilt took a total of seven months to make, and I worked on it full-time daily. Thank you for the visit and comment, Easy. The quilt on which I am now working won't be finished until around Christmas. I wanted to share my progression with my quilting in this hub article. I keep learning and am hoping to get more into the "art" aspect of the craft in the near future. There are some beautiful quilt exhibits on You Tube, if you care to indulge. 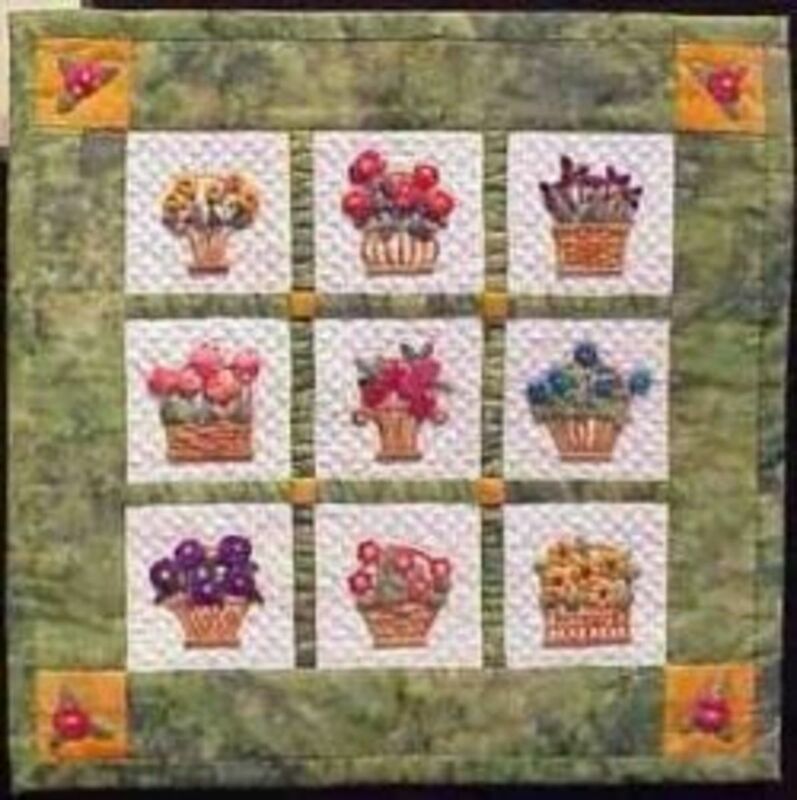 Just type in "quilt festival" in You Tube's search, and you'll find several based in Houston, Texas. Also, I enjoy viewing the quilt gallery of Amish-made bed quilts at CountryLanes.com. Matching twin bed quilts would take a lot of fabric. Personally, I don't know if I'd have the stamina to make two quilts of the exact same color and design (I'd probably get bored). Once I have enough fabric gathered, I enjoy making a quilt on the spur of the moment without a deadline, and I usually don't start another until the project I had started is finished. I still like the look of hand quilting more than machine. The hand technique takes much longer, but there's no substitute for that puffing between the stitches. 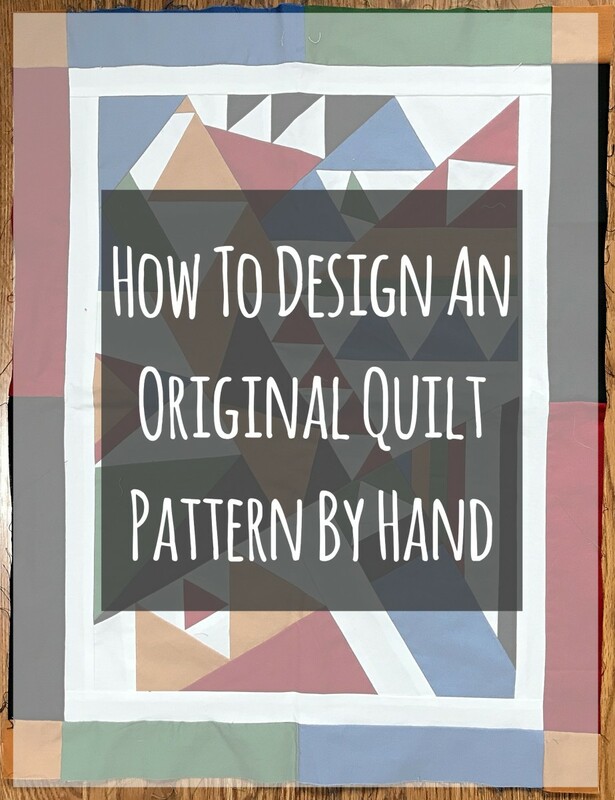 I love quilts but the idea of making a quilt is overwhelming to me. 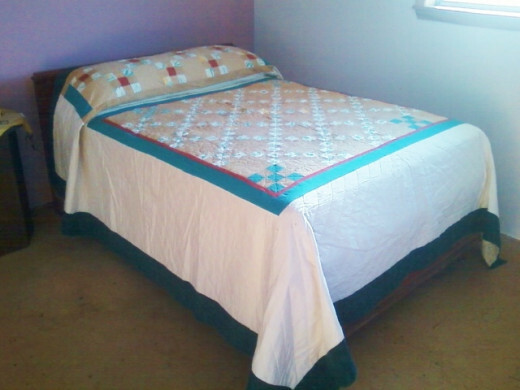 I have asked my Mother In Law to make a pair of quilts for the twin beds for guests. I find quilts to be more comforting than the "comfort foods". There is something that says this is a home filled with love when you see a quilt. Celebrating this American craft is to be commended. Passing it from generation to generation is a tribute to our culture. Sounds good, Miz. The definition of quilt, by the way, is "three layers of fabric bound together." Just a lining would only make two layers. There are cathedral window quilts, however, which have no batting but are considered by the quilting world to be quilts due to the turning technique used to get the unique look of such a quilt. What would really make your panel special in my mind's eye would be to have lots of quilting. I can especially see the hair on the head and any flowing garments as a delightful challenge. Maybe when I retire I'll do that. When the Harry Potter phase was in, Harry Potter panels about 45 x 45 came out. Mom and I each bought a panel. She finished hers, but mine is still in my fabric drawer. It is lined but not quilted. She put a sleeve on top to run a 1" dowel through. It would be hung from a cord attached to each end. I believe we gave it to my granddaughter after mom died. Anyway, Harry Potter will be my first one. What a lovely story, MizBeejabers! 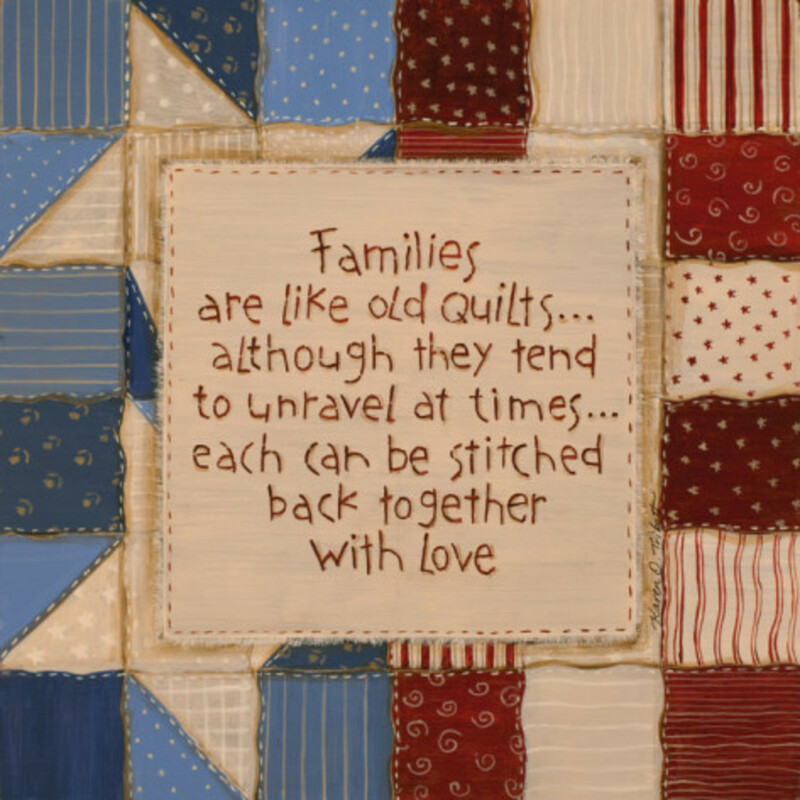 Thank you so much for reading and taking the time to share your story about quilting in your family. I've made several wall-hangings for wedding gifts over the years. I bet with your seamstress experience, you could do at least a wall hanging. The wall hangings make such great gifts for baby showers, birthdays, weddings, and Christmas--any occasion, really. With the smaller wall hanging size (45" x 45"), you actually have enough control to get it under a machine needle. You can just do a simple diamond pattern with parallel sewing lines. You can opt to put a "sleeve" on the back for hanging with a dowel. (Maybe I'll do a hub on that.) The process is not too bad, really, and you can finish a lovely wall hanging in almost the same time it takes to make a fancy outfit. Today there are so many beautiful printed panels available, you wouldn't even have to do any piecing. With your skills, I encourage you to try. --Blessings! I love your quilts. 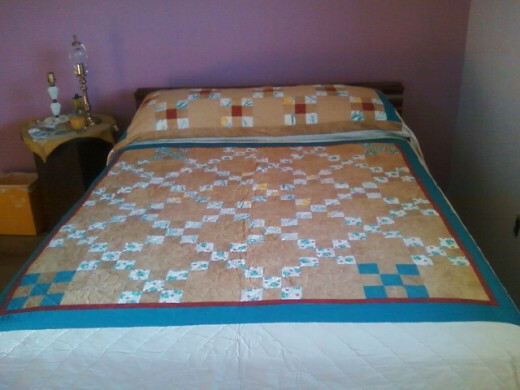 I like the design of the older one and the livelier colors of the 2007 quilt. Quilting has to be in the genes, but I didn’t inherit any. I tried, and although I am a professional quality seamstress, I don’t have the patience to finish a quilt top, much less the quilt. 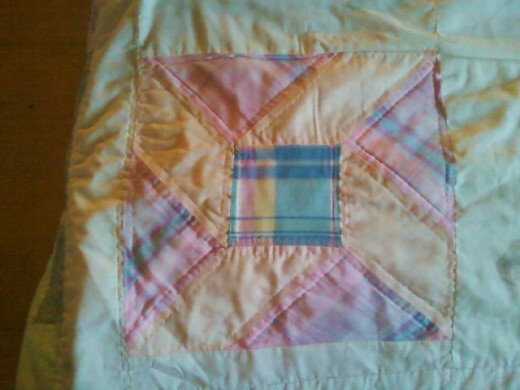 My mom’s youngest sister was a master quilter, and she got mom to quilting again. 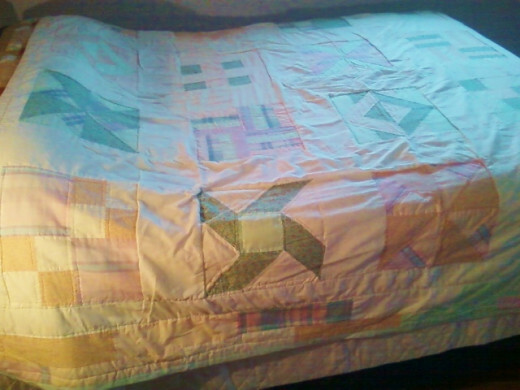 I have most of mom’s quilts, but I gave some to my older son’s wife. After my aunt died, my cousin gave me a quilted wall hanging my aunt made. While mom was in her quilting phase, one day she asked me if I was ever going to do anything with that quilt top Grandma made for me. (Grandma being my dad’s mother) I told her that I didn’t know about any quilt top. Come to find out, that quilt top had been in mom’s cedar chest since I was 4 or 5 years old, and I had no idea that it was mine. She was hinting around to finish it, of course, and I was glad to let her. It was for a full-sized bed and the bed I wanted to put it on was queen, so we picked out a burgundy fabric that matched my dust ruffle, and mom extended the size by making a wide border. I don’t know the pattern, but the top is made of fabric scraps. We used to sit and pick out who had worn the garment made from the material, and if I couldn’t identify a scrap, mom usually could. 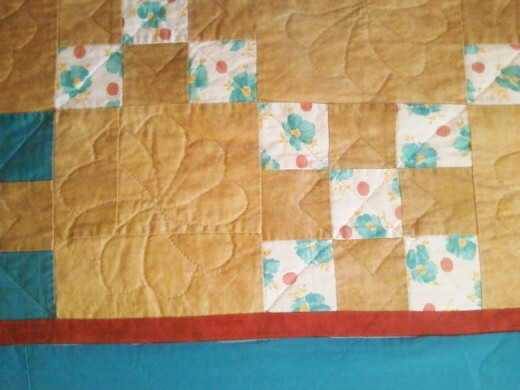 All the women in the family sewed, so all of them had scraps in my quilt. My favorite is from a dress mom made and wore when I was 3 or 4 years old. It was aqua with little white circles that reminded me of the hole reinforcements we used to put on notebook paper. Some scraps were mine, and some were actually printed flour sacks. Thank you for sharing this quilting story with us. There is just something about a hand-made quilt that brings precious memories. 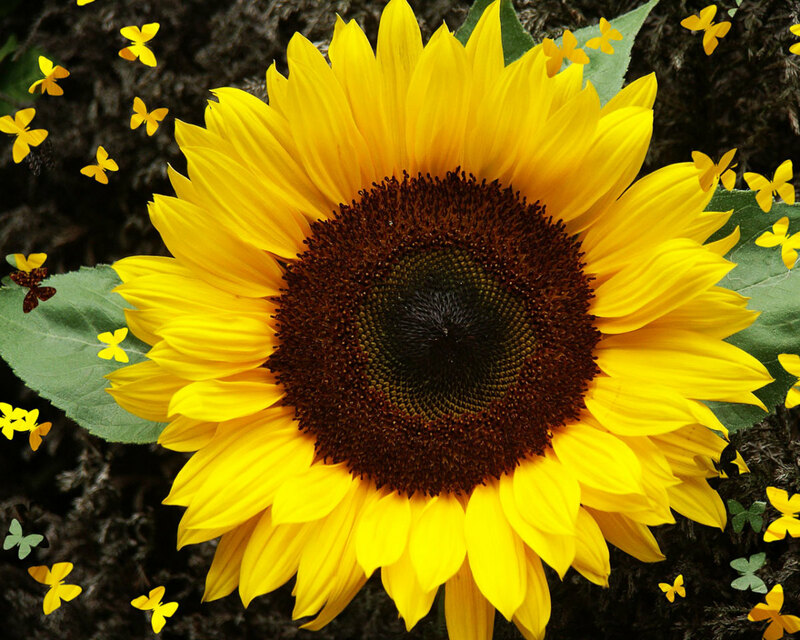 Thank you, Dora and sadstill, for reading and commenting. I would have originally included these quilts in My Quilt Album hub, but I didn't have the pictures of them until my visit to Michigan for my birthday. Then I thought, why not make a new hub and compare them to show my progression for anyone just starting their quilt hand? One quilt magazine had compared the progressions of several quilt makers, and it was interesting to see the changes from their earliest quilts to recent ones. I haven't been as diligent about finishing the quilting on the Fantasy Love Ring quilt which I'm working on now. Maybe writing this hub will inspire me to finish it. Again, thank you both for the reads and comments. I truly appreciate the feedback. my mother in law made thse quilts for my kids. Took a long time to make one. You have every right to be happy and proud of your quilts. The creativity itself is admirable, but there is so much more satisfaction that adds to the joy. The ability to complete it, to give an original gift to a family member, to have it last through the years--and more. Thank you for sharing.